I have had the opportunity to shoot Styer, Taurus, Walther, S&W Sigma, S&W M&P, Wilson Combat, Ruger, CZ, Desert / Baby Eagle, STI / SVI, Browning HP, and several other pistols. In the late 1990's I narrowed my handgun choices to 1911's and Glocks. Because it's what I shot best and what I felt most comfortable with. Up until 2001 I had always been a fan of the .45acp, but felt comfortable with a .40cal. I had always felt that the 9mm was under powered. I generally carried a 1911 on duty, but when it came to stressful shooting (ie. 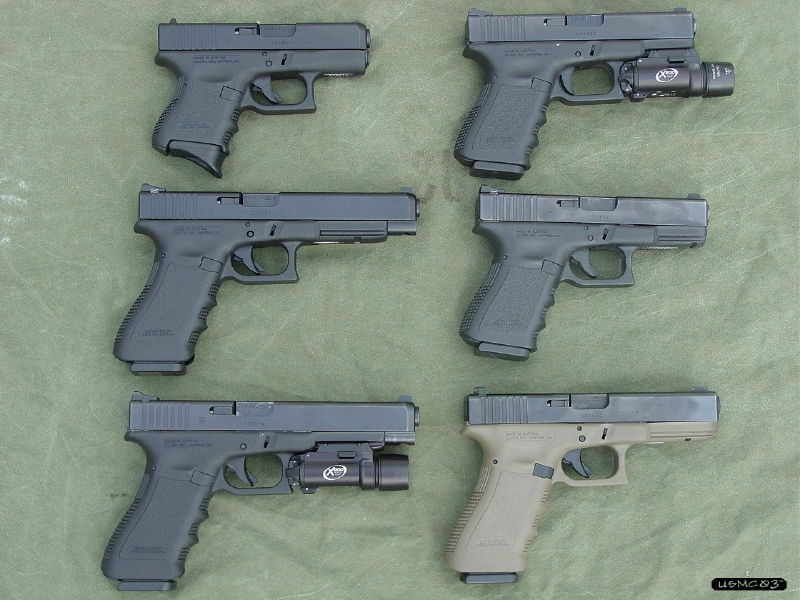 SWAT qual, Firearms Instructor's qual, etc) I would use a Glock because I felt more comfortable with it under stress. I found time and time again that I shot better with a Glock under stress. The Glock had the same trigger pull every time, the grip angle was perfect, no grip safeties to worry about in ackward positions, the size of the grip was just right, no safety levers, decockers, etc. In 2001 I attended a two day tactical pistol course. As a test to myself to see which platform suited me better, I shot the first day of class with a Les Baer Thunder Ranch Special (full size 1911) and the second day of class with a Glock 35 (the Glock 35 is Glock's Pratical / Tactical model and is almost the same size as a full size 1911). It was after this class of shooting 500 rounds per day through each gun, back to back, that I realized that I prefered the Glock platform by a wide margin. I have been through several other training classes, matches, and training, and shot both guns and found that under stress, shooting one handed, shooting in awkward positions, shooting on the move, shooting while trying to perform other tasks other tasks, etc. that the Glock was easier for me to shoot and easier for me to get hits on target. "Why the 9mm"? During a tactical pistol class several years ago, the instructor stated "Pistol bullets poke holes, rifle bullets tear sh*t up". The quote stuck in my mind for some time. I thought back to the effects different pistol rounds having on animals, victim's of shootings, and Officer involved shootings that I had seen personally and read about during my career. I couldn't think of a single shooting where the person or animal was shot with a 9mm and lived, but would have died if the round would have been a .40S&W or a .45acp. And I could not think of a single shooting where a person or animal was shot with a .40S&W or a .45acp and died, but would have survived if the round would have been a 9mm. With 9mm being approximately half the price of .45acp, the recoil of 9mm being less than the .45acp, and knowing shot placement is much more important than caliber, it's not hard to understand why I switched over to 9mm. With one pistol platform in a single caliber it cuts costs when purchasing magazines, holsters, magazine pouches, gunsmithing gear, sights, and ammo. Supporting one platform and one caliber is much more cost effective than purchasing holsters, magazine pouches, magazines, ammo, etc. for several different platforms in several different calibers. After the training class in 2001 (mentioned above) and knowing that I had use the Glock (instead of the 1911) for stressful shooting courses, I started to rethink my mentality on pistols and pistol calibers. I did some soul searching and realized that I disliked the 9mm for many years and favored the 1911 based on the hype I heard from other shooters and gun magazines ("Real shooters carry a 1911" ... "Real men carry .45's" ... etc). Everytime I had taken a pistol class, shot in a match, practiced at the range, etc, it solidified that I shot better under stressful conditions with a Glock. But I was carrying a pistol and caliber due to hype, not on what pistol and caliber suited me the best. Choose the platform and caliber best suits you based on comfort, ergonomics, personal preferences, and what you shoot with the best. Don't get married to a platform or caliber just because you preceive it's cool or because you have a lot of money invested in your firearm or equipment.